I recently found out, via this article on Mindhacks.com, about an interesting paper by researcher Jeremy Bailenson in The Psychologist.1 In it, he reviews recent research on how viewing online representations of ourselves –like our avatars on the Xbox 360 or our Miis on the Nintendo Wii– can affect our behavior. He talks some about modeling healthy behavior and implanting false memories, but to me the most interesting and possibly the most grim part of the article was where he discussed how to advertise products through avatars and by doing so affecting consumer behavior. Even if we know perfectly well that it’s happening. Okay, I fixed the eyebrows. NOW how much would you pay for this stupid bird? And this sort of thing may be thanks to what some psychologists call “self-perception theory.” In a nutshell, this theory refers to how we tend to look at our own actions to infer our own attitudes and beliefs. It’s kind of a “I’m doing X, so I must be the kind of person who likes X.” In one study4 researchers dressed subjects in either black or white uniforms. Those in the black uniforms were observed to act with more aggression and toughness, keeping in line with their stereotypically villainous wardrobe. The researchers also argued (and showed with data) that this is why referees in professional sports are biased against teams that wear dark colors and are more likely to call penalties against them. Think of your avatar as a kind of uniform you wear (a notion supported by research, by the way), and you see the connection. So, given all this I’m going to once again give out some evil ideas to those people in marketing. This kind of marketing-via-avatar thing could so easily be incorporated into video game avatars like those used by the Xbox. It’s not unusual for games to give out “avatar awards” for completing in-game actions. My little dude has a Locust mask from Gears 3, a sombrero from Red Dead Redemption, and a little Guilty Spark toy from Halo 3. Fun! But what if instead of watching my avatar play with a miniature RC Warthog I saw him chugging a can of Mountain Dew? Or perusing the latest issue of Wired magazine? Or gobbling fries from Burger King? According to the research described above, I’d be more likely to remember or even favor those brands over traditional advertising because there’s something psychologically important about seeing a representation of me interacting with them. Another study reported in the journal CyberPsychology & Behavior5 found that “advergames” designed to advertise junk like Pop Tarts and Fruit-By-The-Foot snacks to children were rated as more enjoyable when they let the player customize his or her avatar. Heck, we don’t even have to bury this kind of thing in the Xbox dashboard. I imagine games could easily pull our likeness in the form of our avatar6 and display them to us holding up boxes of Stay-Free feminine hygiene products or Kibbles ‘n Bits dog food while we wait for levels to load or matchmaking to happen. Well, maybe those are extreme examples. But you’d think that game companies would at least start using this kind of thing to cross-promote games. If I were EA, I wouldn’t include a snowboard with a SSX logo as an avatar reward in that game. I mean, the customer has already bought that game, right? I’d include a N7 jumper from Mass Effect 3. That’s what you want your customers envisioning themselves playing at that point and that’s what you want them associating with themselves when that game hits the shelves. Or you can show them holding up a box of dog food. Your choice. 1. Balenson, J. (2012). Doppelgangers — A New Form of Self? The Psychologist, 25, 36-38. 2. Ahn, S. and Balenson, J. (2011). Embodied Experiences in Imersive Virtual Environments. Paper presented at the 97th Annual Conference of the National Communication Association, New Orleans, LA. 3. Interestingly, social/professional networking site LinkedIn is apparently taking this concept to heart and running an ad campaign where they insert users’ profile pictures directly into representations of a client companies’ recruitment literature in an attempt at getting people to apply for jobs there. 4. Frank, M., & Gilovich, T. (1988). The Dark Side of Self and Social Perception: Black Uniforms and Agression in Professional Sports. Journal of Personality and Social Psychology, 52, 74-85. 5. Bailey, R. Wise, K., and Bolls, P. (2009). How Avatar Customizability Affects Children’s Arousal and Subjective Presence During Junk Food-Sponsored Online Video Games. CyberPsychology and Behavior, 12(3), 277-283). 6. Assuming, of course, you’re not one of those people who make ridiculous looking avatars that look nothing like you. You see, I had a heart attack 7 years ago, and I don’t eat french fries. They will kill me. Such an animation would just make me angry, resentful, and like I can’t control my own body. 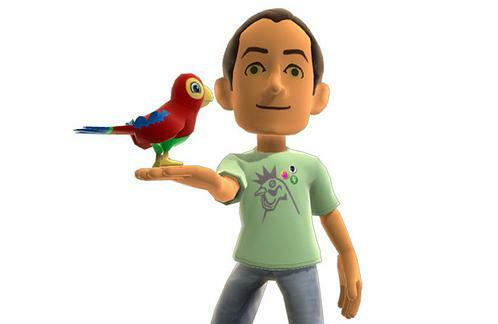 I don’t own an Xbox 360 so I don’t know how that works… Do these avatar gifts show up to your friends as well? I don’t know that this would apply directly to the dashboard where my avatar appearance is self-selected rather than imposed by an advertiser. The clothing or props I use for my avatar are likely to be for products I already like, own, or plan to buy.